Welcome to the Hints and Tips section of The Puzzle Club. Here we look at some methods and hints you can use to help solve kakuro puzzles that you attempt at the Puzzle Club. The best way to get started no solving a kakuro puzzle is to look for places on the puzzle where are the least number of possibilites. Often, but not always, these are places where there are only two cells to fill. Look for either very low or very high numbers. 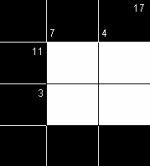 Thus in the puzzle below you will see a '3' composed of just two cells. This can only be '1' and '2' or '2' and '1'. It is worth noting these down as pencil marks on the grid. Similarly, if there had been something like '17' off two cells, then you would know that must be '9' and '8' or '8' and '9'. These can often then be used to help work out what values in adjacent runs must be. Another useful method you can use to help deduce the numbers that must be placed in certain areas of a puzzle is to use the 'common numbers' technique of solving a puzzle. You will notice that the bottom right square is shared between the run of '3' and the run of '4'. Now, the '3' can only be composed of '2' and '1' and the '4' must be '3' and '1'. The only number in common between these is the '1', and therefore we can place the bottom right cell as '1'. This in turn allows us to place the bottom left as '2' to make up the '3', the top right as '3' to make up the '4' and the top left as '5' to make up the '7'. (The other cell that makes up the '11' is not shown in this segment of the grid). You will find that you will need to use this method often to solve puzzles, so be sure to practice it!